Get knocked down twice. Stand up three times. 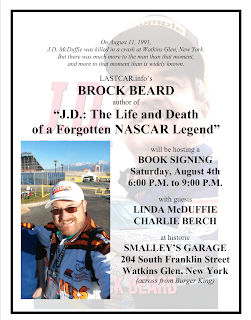 After last month’s setback, we have a new book signing for the upcoming NASCAR weekend at Watkins Glen International. It will not be at the track, but will be in Watkins Glen itself, on that weekend, and at a location significant to the track’s history. I will be there to sell and sign copies for $20 apiece, and I will not be there alone. 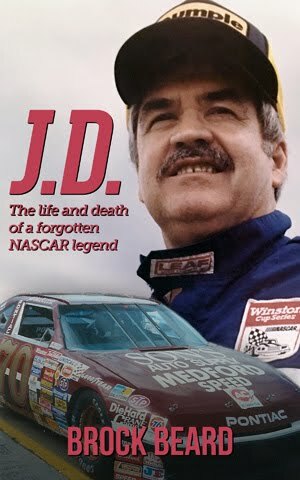 Joining me that night will be J.D.’s daughter Linda McDuffie, who will be making the trip to the site of her father’s last race for the very first time. Linda will also be selling J.D. t-shirts and lanyards. She will also be at the track that weekend, and will have more information about that on her Facebook page here. As for the NASCAR weekend itself, I will be in attendance for the Go Bowling at the Glen weekend, but unfortunately I will not have media access for LASTCAR.info. 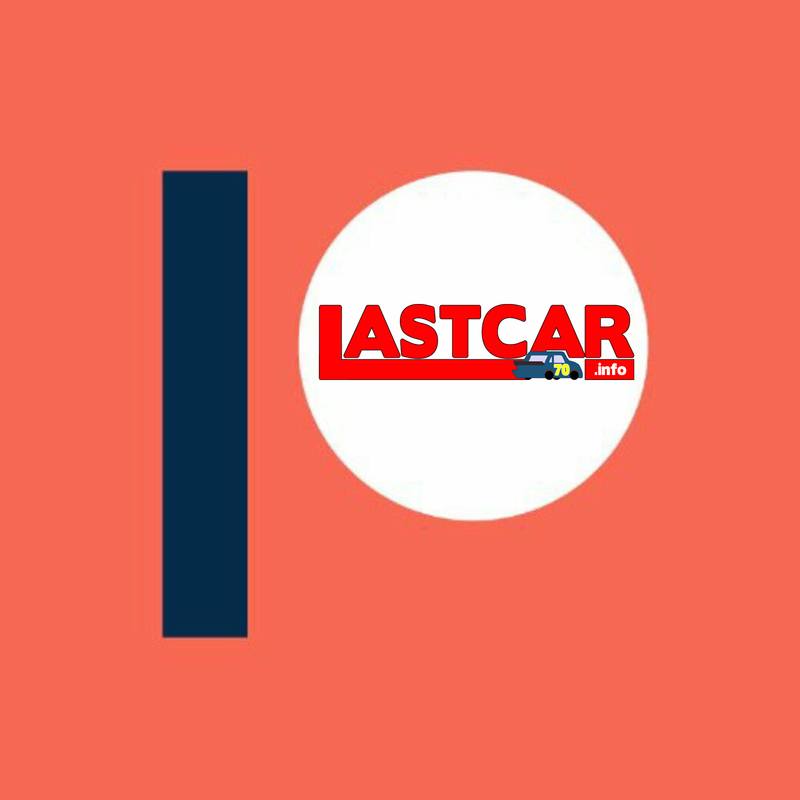 Despite my best efforts, and despite our successful coverage at both Sonoma and Darlington, I was told that LASTCAR.info is not “an accredited media publication.” While I am extremely disappointed that they saw things that way, I respect their decision. 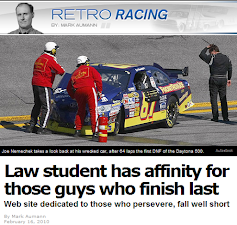 Instead, similar to this past March in Fontana, I will be providing the best coverage I can from the stands, specifically The Ninety in Turn 1. 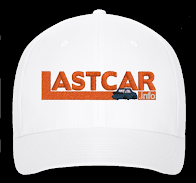 Expect LASTCAR.info reports on both Saturday’s XFINITY race and Sunday’s Cup event, as well as several updates on Twitter through @LASTCARonBROCK. On top of all this, I will also be making a trip north of the border to Ontario to meet with motorsports artist Rob Taylor, who we featured in 2013. Taylor has shared our passion for NASCAR history in his art, and has done several drawings of stars past and present, including McDuffie. As always, thank you for your support, and if you’d like to order a copy of “J.D.” from me, the full details can be found here. 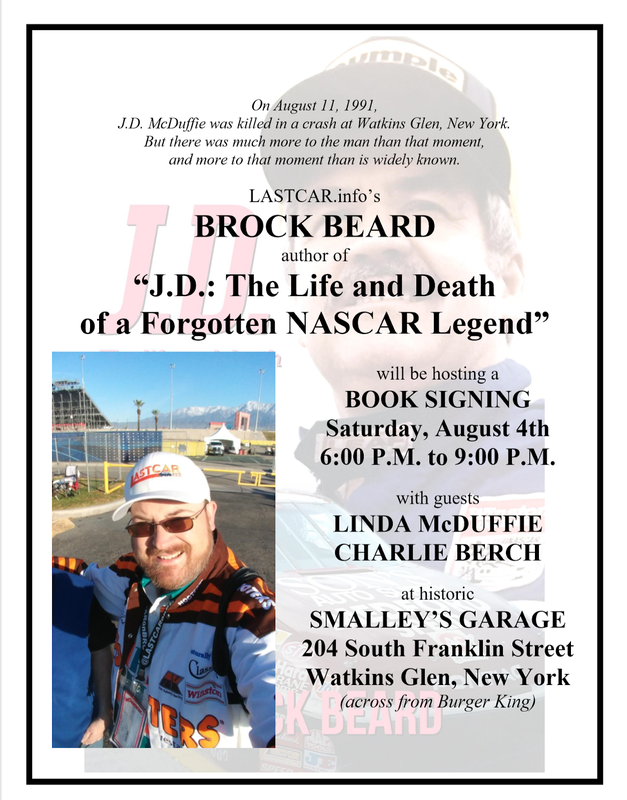 You’re also welcome to bring your copy to Smalley’s in Watkins Glen; I’d be happy to sign it for you. And so, one year after #LASTCARlington, your last-place headquarters heads to upstate New York for the #SteamedHamsTour2018!